Professionals also know where to cut the branches, so that the tree doesn’t suffer. It may seem like a simple act–trimming a few branches, just to get those pesky leaves away from your fence or your electrical wires. With a saw and an ax, you should be able to do this yourself, right? Wrong. Improper tree care can seriously damage and even kill your trees, turning your landscape from a foliage paradise to a barren wasteland. If you don’t want your trees to suffer from bad grooming technique, read on to find a solution. Tree topping, otherwise known as tree pruning or crowning, is the process of trimming back branches so that the tree is either no longer a danger, or is encouraged to grow. When trimmed correctly, new branches will form as the tree repairs itself. Professionals also know where to cut the branches, so that the tree doesn’t suffer. 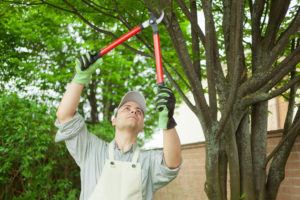 Trimming or pruning trees by yourself can be harmful, because you might not know the specific area of the branch where you should be cutting. Also, if the branches are in unsafe areas, you could be putting yourself in danger, as well. How Does This Affect the Tree? Trees without leaves are starving trees. You may have seen this around your neighborhood–stumpy, leafless trees, marring the front yard of the home next door. This is improper trimming. Trees always need green, healthy leaves to collect sunlight. They are plants, and need to photosynthesize. Not to mention, cutting off branches in the wrong place can cause the tree to not heal properly, leaving an unsightly dead stump sticking out. Call a professional arborist to trim your tree. If you notice the branches of your tree are dangerously close to some kind of hazzard, have a professional come out and take a look. It’s entirely possible you may not be looking at it right, and an arborist may tell you trimming is unnecessary. If a tree does require maintenance, calling an arborist will mean getting a professional to do the job. There won’t be any unnecessary cuts, or harming of the tree. Call Nelson Tree Specialist for your tree trimming services. We are experts in the art of tree trimming, and want to work with you to provide the best care for your trees. After we’re done, your trees will be thriving and safe as they beautify your landscape. This entry was posted on Thursday, July 14th, 2016 at 5:09 pm. Both comments and pings are currently closed.